The conversation took place during the 2016 Green Academy and is a part of the series of interviews conducted by Bartul Čović. Derek Wall teaches economics at Goldsmiths College and is a member of the Green Party of England and Wales. At the Academy he gave the introductory lecture on “Commons and Green Politics”. BARTUL ČOVIĆ: In the last year and a half we’ve had two interesting referendums, the failed Grexit and now Brexit, and general statistical study of the referendum results shows that mainly lower social classes expressed their lack of confidence in the European Union. Of course, in the Greek example there are many different readings of the referendum questions and in the end the will of the majority was not respected, but how do you think the British Left will do in this really specific and dynamic political context? Do you think it will be able to mobilise and capitalise on this growing anger? DEREK WALL: Jeremy Corbyn has become a phenomenon, he is like a symbol. He has emerged purely by accident. But that has captured a lot of popular discontent. In turn, the referendum was an imaginary solution to a real problem. You have real problems in the sense that there’s austerity and there’s democratic deficit. So for example Britain has never been a truly democratic country. It struggles to be formally liberal democratic, but we have an unelected head of state, the royal family can still intervene in politics, we have an unelected House of Lords, we have an electoral system which means representation from smaller parties isn’t generally taken into account. Both in terms of economics and austerity and lack of democracy, Britain is in crisis. And then that crisis was expressed during the Brexit referendum as purely racism. Right wing populists like the UKIP Party argued that all of Britain’s crisis was because of foreigners. This xenophobia was used to turn discontent about austerity and frustrations about democratic participation into a campaign to leave the European Union. This was a British manifestation of a world wide trend, think Trump in the USA or Orban in Hungary. Jeremy Corbyn, the Labour Party’s first truly left-wing leader in its history, is a much more positive product of the real problems Britain has. As I say nobody on the Left including Jeremy expected him to be elected as Labour leader. Now that you mentioned the rising of extreme right, not just movements, but governments in Europe, that we have all followed for the last 10 or even 30 years in Balkan terms, do you think that anti-fascism as an old political platform, designed by the Left in order to defeat the fascist threat 70 years ago, could be revitalized and be one of the mobilising policies and platforms for the new Left? I think anti-fascism is essential, I think that the anti-fascist struggles from the Second World War and since have been heroic and important struggles. Physically confronting fascism is only part of the solution. There has got to be a kind of cultural politics. The politics of figures like Chantal Mouffe, she talks about populism, post-Marxism, post-structuralism, is part of this. However, this form of analysis has been academically obscure, has tended to be anti-Marxist. In Britain precisely it helped people like Tony Blair. But nonetheless you need a cultural politics. It’s not just meeting fascism as a physical force. It is understanding how culture is used to construct fascism. So what we have to do is intervene culturally, in terms of the symbols we mobilise, the discourse we mobilise, and in Britain it’s very much challenging the media, because you have the right-wing tabloid populist media that basically takes people’s fears and crystalises them around the image of the other. Our tabloid media takes people’s real fears, racialises them and you then have to come up with ways of challenging the media. So for example, in Britain there’s a lot of discourse around progressive alliance, Greens working with Corbyn, I think that’s good. But not enough on its own. A powerful right wing media can fix its meanings and in doing so it helps construct a racist populism. So what I’m interested in is cultural politics that comes from Marxism, because there’s a cultural moment of ideology within Marxism. So we go back to Althusser and how to construct alternative identities and mobilise them. And what you articulate with that is the idea of radical democracy. Because lack of real democracy where people get to make decisions and participate is vital, lack of real democratic choice fuels a discontent that is transformed by the right. So to fight fascism, one of the elements of that is to fight it in cultural way and another element is to recognise the authoritarianism is increasingly populist and you have to find ways to turn that into Left populism in the sense of actually constructing democratic societies. You mentioned the elimination of Marxism in academic circles. This is common in Croatia since the dissolution of Yugoslavia. As a scientific methodology Marxism was completely wiped out until maybe five or six years ago, when a new generation of professors showed up, and it seems to me that the representation of anti-fascism also lost its clear political and class connotations and became kind of middle-class civic values narrative. Is that among the things you had in mind when you said that we have to change our strategy to show that fascism was actually born in order to crush the workers’ struggle? To an extent it’s much easier to work within the Marxist problematic, partly because the post-Marxist politics of Blair is utterly collapsed. So it’s easier on the Left in Britain to use terms from Marxism. I also feel you need to have an element of pluralism, there is not one correct universal answer or analysis. I would agree that fascism is something that was constructed to oppose socialism and kind of stop working class self-confidence, I think that’s part of the picture, but I think it’s too simplistic. What we go back to is basic political themes. Spinoza in his Theological political treatise poses an essential question: why the human beings fight this hard for their oppression, as if it were their liberation. And then Wilhelm Reich kind of repeated this question when he talked about the mass psychology of fascism. I’m not really into psychoanalysis, but people sometimes celebrate fascism. Within us there are drives to obedience, so there’s that layer of analysis as well. I am not saying humanity is doomed to obey but I do think an analysis of our motivations is part of the picture. Lacan has something to say about this but it is very difficult to grasp, or at least I find him difficult to understand. I did find that Yannis Stavrakakis’s book The Lacanian Left: Psychoanalysis, Theory, and Politics quite useful on all this. In talks with people at the Green Academy about various experiences of the Left in the last couple of decades they all mention the similar problem – a shift of the Left movements towards representative politics when they arrive to electoral success. We have experiences of Syriza and of the Initiative for democratic socialism in Slovenia, in which there is a complete alienation of parliamentary representatives and the base of the party. Do you think that after the failure of Syriza the Left should think about other forms of struggle other than the parliament? Can the Left even win a battle through parliamentary politics? There is not a straightforward strategy. We are in situations of unequal power that means that any strategy from the Left is likely to fail. The non-state option used by the Zapatistas failed and yes, Syrizia failed too. There is not a clear easy road map. All we can do is think more clearly about how to achieve social and political change. This is to be the Machiavelli moment in politics. Incidentally, while he wrote The Prince, it should not be forgotten that he was a radical democrat, an official in Florence which was a city state, a Republic in a Europe of monarchs. So from the sociology of the repertoires of direct action used by social movements to the experience of the left in government, we need to keep learning. I’m lucky enough to have spent time with Hugo Blanco, the great Peruvian ecosocialist revolutionary, who led an uprising for land rights in the 1960s, but is still active today, publishing Lucha Indigena. His faith has been in the social movements and direct action but he was also for a time a Senator. I think the question of change is often posed in a sectarian way, it needs to be open and well explored. I also think that different as they, are both Althusser and Ostrom have much to say. Althusser noted that communism failed partly because it failed to build genuinely democratic institutions, the revolutionary moment is not enough, you need institutions that empower people and build a culture of the commons. While in the USA on the other side of the Cold War, Elinor Ostrom and her husband Vincent had a similar critique, noting that institutions designed with care were part of the process of transformation. To me politics has a Machivelli moment, of strategy. But strategy is difficult, open and constantly demands more work. It also has an Ostrom moment, where societies need to respect plurality and build, again difficult as this is, institutions to promote cooperation. 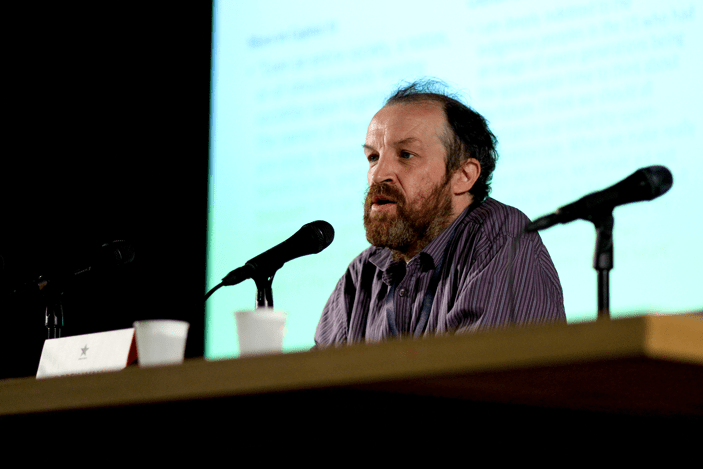 Derek Wall is the International Coordinator of the Green Party of England and Wales. He joined the Green Party in 1980, when it was known as the Ecology Party. He was Principal Speaker of the Green Party between 2005-2007 and is a local councillor in Winkfeld, Berkshire. He has had eleven books on green politics published. Derek teaches New Radical Political Economy at Goldsmiths College, University of London. His main academic interest is in the work of Elinor Ostrom, the only woman so far to win a Nobel Prize for economics, for her work on commons. His books on commons include The Commons in History (MIT 2014) and The Sustainable Economics of Elinor Ostrom (Routledge 2014). He is also a founder member of Green Left and the Ecosocialist International Network. As a patron of Peace in Kurdistan and works closely with Kurdish activists in the UK.